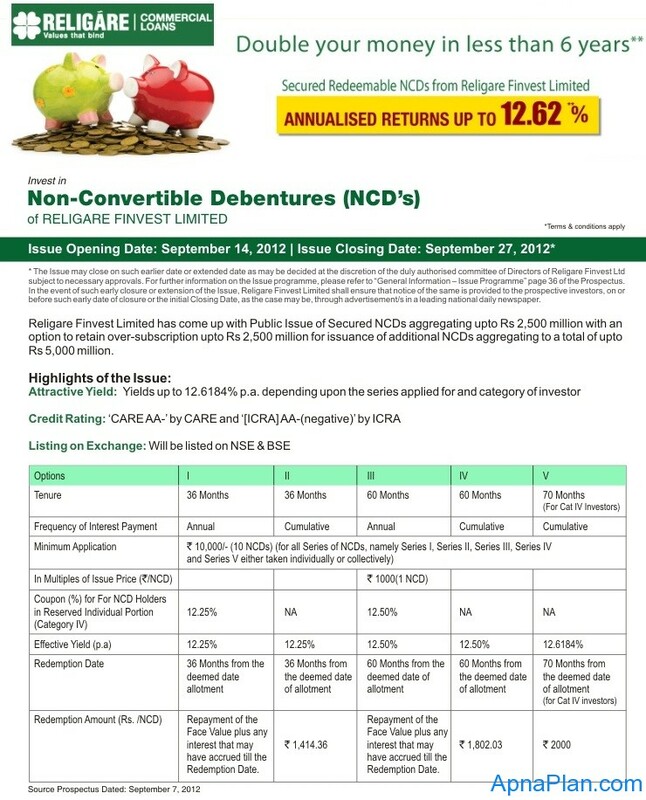 Reliagre Finvest a subsidiary of Religare Enterprises Ltd, has opened its secured NCD for subscription on September 14, 2012. The company focuses on small and medium enterprises (SME) and retail capital market financing. It has been rated AA- by both CRISIL and ICRA, which means that the investment is safe. Its offering coupon rates of 12.25% – 12.50% and has an option to double your money in 70 Months. Attractive Interest Rate: Interest rate of 12.725% – 12.50% withwith yield of 12.6%. There is an option which doubles the money in 70 Months. Secured NCD: It is in the form of secured debt with ‘first floating pari passu charge’, which means that the debt is fully secured and is not subordinate to other debt providers. In case of liquidation of the company and your debt is secured against immovable property of the company, if any. High Risk Company: The company is in capital market financing which is a higher risk activity. Rising NPAs: A quick glance at the financials of the company reveal that gross NPAs (non-performing assets) have massively risen from Rs86.21 million on 31 March 2011 to Rs1,067 million on 31 March 2012 and the Net NPAs have increased from Rs17.71 million on March 31 2011, to Rs645.60 million on March 31 2012, which paints a gloomy picture. Illiquid Investment: NCDs are typically illiquid and thinly traded. If you want to sell them, there may may not be many takers in the secondary market.